UPDATE 10/1/2014 – Price reduced to $7250 but very negotiable based on amount of work done here at Moes Marine after purchase. We would love to add this to out winter work list for 2015 and see this on the water next year! This boat sailed into our yard in fall of 1997 after a long sail through the Great Lakes from Chicago. The owner stored “Loki” with us for the winter… and we never heard from him again! After repeated attempts to contact him, we eventually gave up and went through the legal process and auction to obtain the title, which completed in 2005. Knud Reimers designed the boat in 1933 and the boats are currently found all over the world. Ingemar Svala, a local Vermilion photographer, has a special interest in the boat (since it was designed and built in his native country of Sweden) and took many photographs of “Loki” when we brought it outside to move to another of our buildings. “Loki” has been stored inside since 1999. We built a steel cradle for it a few years ago. Although there is some structural work (needs one plank on starboard side amidships above waterline, new ribs in same area as planks, and new cockpit coaming), it is mostly a cosmetic restoration. We have all the hardware and rigging. 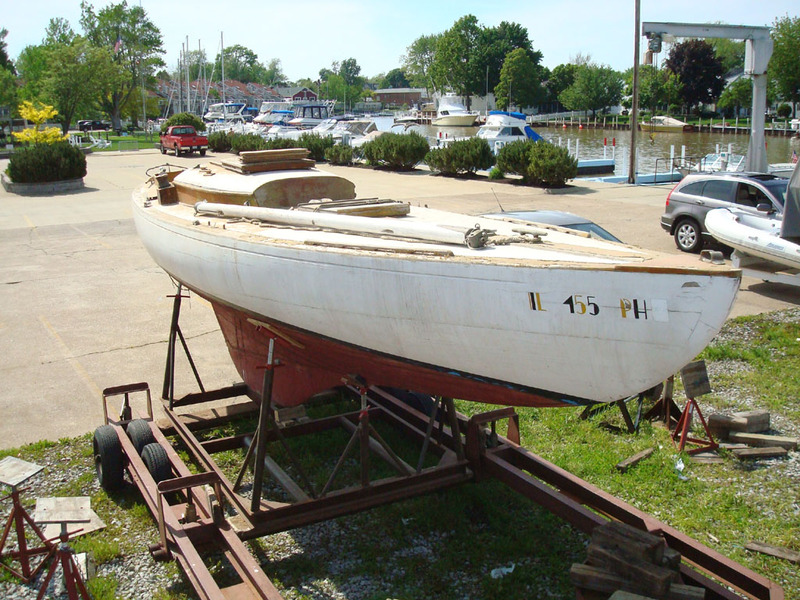 The price listed above includes lifting the boat onto your hired trailer (or purpose built trailer for the boat) and all parts and accessories loaded and taken away; however, the asking price is very negotiable based on the amount of work contracted upon the sale of the boat to be performed here at Moes Marine. Please contact us if you are interested in this boat.